Saioa Hernandez has established herself as one of the most exciting sopranos of her generation, with critically acclaimed performances across Europe, Asia and the Americas. 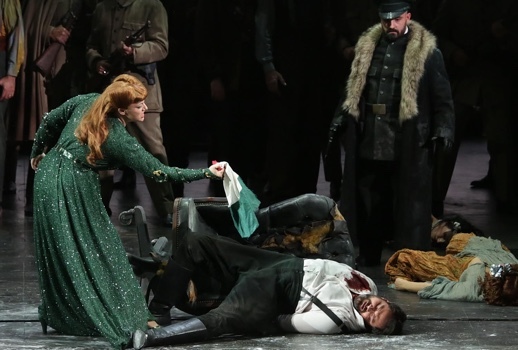 Hernandez’s engagements for the 2015/16 season include Mathilde in Guillaume Tell at Grand-Théâtre de Genève, the title role in Norma at Teatro Verdi di Padova and Teatro Verdi di Trieste, her debut as the title role in Luisa Miller at Teatro Verdi di Trieste, her debut as Aurora in La del Soto del Parral at Teatro de la Zarzuela in Madrid, and Micaëla in Carmen at Greek National Opera. This coming fall, Hernandez can be heard as Soleá in El gato montes at Palau de les Arts in Valencia. In the 2014/15 season, Hernandez sang the title role in Lucia di Lammermoor at Amics de l’Opera de Sabadell in Barcelona and Violetta in La Traviata at Opera Giocosa in Savona, Italy. Her engagements for the 2013/14 season included her Australian debut as the title role in Norma with the Victorian Opera, the same role at Opéra de Lyon, Soleá in El gato montés at Teatro Nacional de São Carlos in Portugal, and Soledad in Curro Vargas at Teatro Calderón and Teatro de la Zarzuela in Spain. In the 2012/13 season, Hernandez sang the title role in Tosca at Amics de l’Opera de Sabadell, the title role in Lucia di Lammermoor at Ópera de Oviedo, Soleá at Teatro de la Maestranza and Ópera Oviedo, and made her Brazilian debut as Imogene in Il pirata at Teatro Municipal de Rio de Janeiro. Other roles in Hernandez’s repertoire include Fiordiligi in Cosí fan tutte, Rosina in Il barbiere di Siviglia, Rosalinde in Die Fledermaus, Gilda in Rigoletto, Olympia in Les contes d’Hoffmann, Mimí in La Bohéme, and the title roles in Suor Angelica and Madama Butterfly. On the concert stage, Hernandez has performed Verdi’s Messa di Requiem, Mahler’s Symphony No. 2, Mendelssohn’s Elijah, Orff’s Carmina Burana, Rossini’s Petite Messe and Stabat Mater, as well as Mozart’s Requiem, Krönungsmesse and Vespri sollenni di confessione. She recently debuted Wagner’s Wesendonk Lieder for Spanish Classical Radio and Beethoven’s Symphony No. 9 at the Palau de la Música in Barcelona. Hernandez has also appeared in many Zarzuelas, including La Marsellesa, La Verbena de la Paloma, Los Descamisados, Los hijos del batallón and La tabernera del puerto, among others.